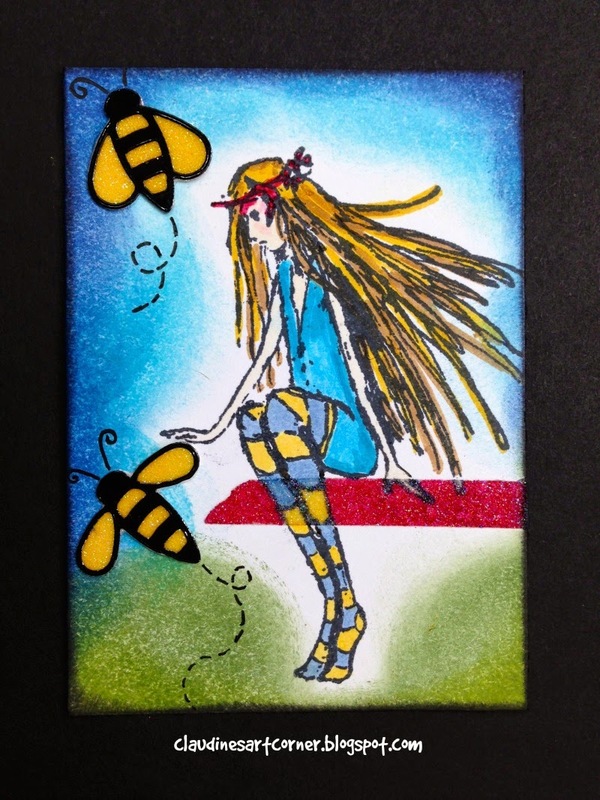 Claudine's Art Corner: Stampotique Challenge 173 - Bring on the Bling!! Stampotique Challenge 173 - Bring on the Bling!! Hello all thanks again for coming by the blog, this week our Design Team Challenge Blog Challenge is all about "Bringing on the Bling"!! Our wonderful hostess France Papillon has picked out theme this week. I added bling in the form of ultra fine glitter to the bees and the red line that Stella is sitting on. I think it turned out fun and colorful! Stella looks beautiful, Claudine! She is the perfect size for an ATC, and the bees are the perfect "support staff!" Great use of your glitter, too. Love your bright colours! Stella looks fab on her ATC ! Team ATB and 100 Proof Press Blog Hop!! !